My other journal I'm pretty sure they are mostly Incisitermes, or a mix of them and also some type of Dampwood. The colony I got today however I know 100% they are Incisitermes minor. So, I thought the colony be better for it to be in its own topic instead of mixed up with my other weird colony. Me and my wife were walking down the river and as we were coming up, she noticed a tree had been uprooted and must been washed down the river. 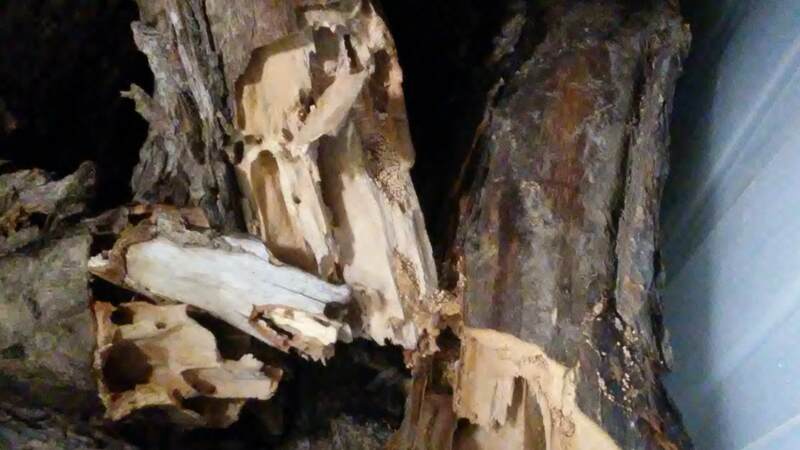 I didn't notice at first, but then when she pointed it out I saw a separate log that looked like it had...at least at one point...had signs of termites in it. The log got there in the last thunderstorms we had, and must been washed down the river after breaking off from some tree somewhere. I saw tons of Argentine ants invading part of it, but I thought I'd take the chance and see if there was any termites in it. And what do you know, I broke a piece off and it was almost raining with large and tiny I. minors. Even saw a couple soldiers inside the wood piece I broke off. So I went home and got a trash bag to put the wood in. I did keep breaking wood pieces off (easy enough to break with my foot) and there must be at least 500 termites in there. Could be a lot more, but its hard to tell of course and I don't want to kill them by breaking their entire home. But one big difference is I got vastly more termite nymphs than I got compared to my other colony. So even though Argentine ants were invading the log, they must have just started the invasion and also termite nests are hard to invade to begin with. Lucky timing and good thing my wife saw the uprooted tree otherwise wouldn't have noticed the log next to it. Even if the Argentine ants didn't eventually kill them, they'd been washed down the river and drowned eventually once it rained again. So I got them all and set them up in a much larger setup than my other colony. I put them in a large (plastic) storage bin that easily fit all the wood pieces. The only worry I have is the plastic is kinda weaker than the plastic aquarium I have with my other colony, so they can eat their way out even easier. But, I haven't seen this to be a problem (yet) in my other colony, as long as they have enough wood to eat. Edited by Vendayn, March 30 2019 - 2:44 PM. At least short term, my wife pointed out they already look much healthier than my other colony. And I can actually tell, for some reason this colony is a lot more lively and also not having workers die within hours. Not a single one has dried up and died and I haven't even added water or anything. Quite a lucky find. Looks like finally going to have a (very large) healthy colony of Incisitermes minor, as usually by now, the last 2 attempts, I had a bunch already dry up and die by the 2 hour mark. 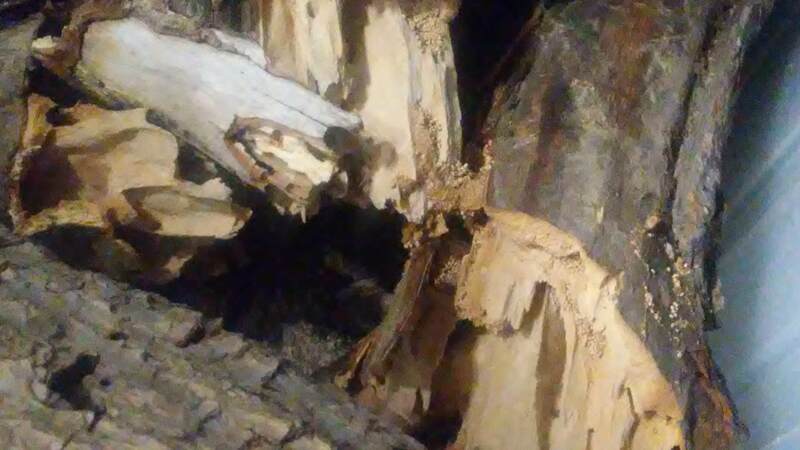 Good thing took a walk to the river and my wife had a good eye to see a tree uprooted, or never would have found the log with I. minor in it. A new day later, and the termites are still active. They seem to have sort of a trail, going from one wood piece to another. Not a single dead termite either, which is great. I haven't even needed to add a drop of water or anything. Just a couple pictures of the setup. A big storage bin is pretty much what I used. Nothing fancy, but actually a lot better than what the other colony is in. And actually, the plastic is a lot more smooth feeling, so I don't think they'd be able to grip their way out (unlike the plastic aquarium of my other colony). Not a single one has died despite 0 water at all. 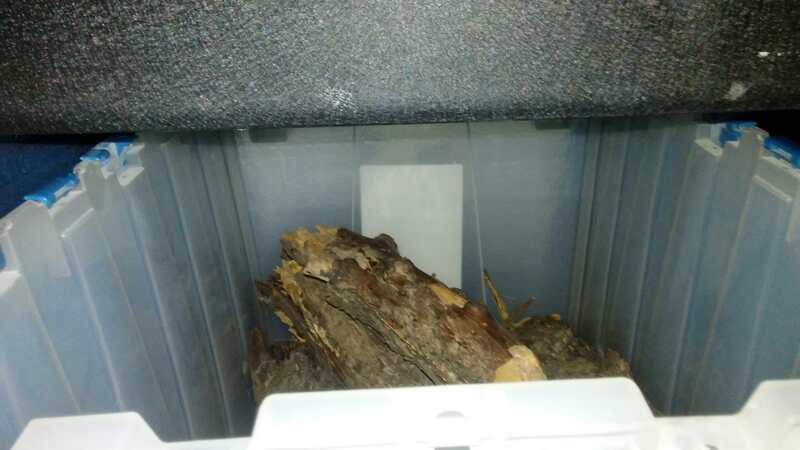 So, they are truly "Dry"wood termites unlike my other ones. Edited by Vendayn, October 30 2018 - 3:22 PM. Got to see one of the false workers bring out a tiny sawdust piece (think that is what it was, could have been frass) and place it in a pile outside the entrance to one of the wood pieces. I haven't seen them actually work like that before, so it was interesting. Very different in how they pile it up compared to other termites I've kept. I've had subterranean termites and they don't really have the same behavior. They can make mounds and mud tunnels of course. In this case its kinda like a small ant mound where they pile dirt outside the entrance, but sawdust and frass instead of dirt. Well, that was unexpected. But, I saw the queen come out briefly and disappear pretty quick. Too bad didn't have my phone, but might have been too quick anyway, for me to get camera ready. She was pretty long and rather fat. I didn't actually know I had a queen, so I must have got the entire colony. Hope I got a king, cause I didn't see a male with her. Edited by Vendayn, November 2 2018 - 7:15 PM. Interestingly Incisitermes minor build "mud" tunnels like subterranean termites do. Except, instead of dirt, its made of wood/sawdust particles and probably their frass. You can kind of tell in the picture, but they are still building it. Its in the middle/bottom part of the picture where the two woods connect. Edited by Vendayn, November 4 2018 - 10:59 AM. That's pretty neat - I think we were unsure if termites did that, (build tunnels out of cellulose that is), or at least if Reticulitermes did. Edited by Nare, November 4 2018 - 12:43 PM. I. minor (and most Kalotermids I believe) will use their frass as barriers, mostly to seal or block tunnels and probably whatever other debris they find. Being a dry medium though I doubt I. minor could build any stable structures though. In the picture though, it shows they've actually been building a cellulose tunnel between both pieces of wood. I'll take another one in a week or two as they progress, but the tunnel structure is noticeably different than when I first saw it. It isn't their frass as I see that piled up. But, its an actual tunnel structure they've made. I thought it was just part of the wood when I first saw it, but its bigger now and on its way of connecting to both parts of the tunnel. Part of the structure is also just hanging in the air, so its strong enough that the end of it doesn't need underneath to support it. It looks like both sides will be connected by tomorrow or in a couple days (they are expanding it fast) and then I won't see them travel on their trail between both pieces of wood. But, its cool seeing them build it. Edited by Vendayn, November 4 2018 - 11:51 PM. They connected both cellulose tunnels. It is sturdy enough the termites can walk through without it collapsing, even though a small part of it doesn't have anything underneath it (just air underneath). Interesting, I wonder if these structures have been recorded in the wild. I'm not sure. I've never seen cellulose tubes in the wild, but then I may just not have been looking for their tubes so didn't see them. I've never seen it documented anywhere though, that Incisitermes can create things like that. And definitely never seen pictures of anything like my colony built. I think I might be the first person to actually take pictures of their cellulose tubes. Unless there is some hidden away article about the cellulose tubes, or some old paper on it somewhere. But of all my time researching Incisitermes, never seen or heard anything like that. I was actually pretty surprised they built an actual strong structure to travel between the wood pieces. It looks like something subterranean termites would build. Colony is doing great. They expanded their cellulose tunnel a tiny bit more but otherwise its the same. Part of the colony moved into another piece of wood, and it has a lot of activity of termites that I can actually see. My first actual good colony of Incisitermes minor. Granted haven't had success with alates yet, but at least got a very healthy colony going. Got super lucky with finding that wood on the ground, cause they'd been killed by Argentine ants in a day or two. I won't be keeping Incisitermes minor again. No idea what I do wrong, but no matter where I keep them or the environment or what setup I use, they always die on me. For some reason, I do great with dry climate ants and terrible with ants that need moisture. For termites, I tend to do terrible with dry climate termites (except one dry climate colony/species I had did good) and do great with termites that need moisture. Edited by Vendayn, February 26 2019 - 6:36 PM. Well, 4th attempt at a colony of Incisitermes minor. Less than 50 termites I'd say, and some pretty decent sized soldiers. Plus some nymphs. Dunno if there is a queen/male, but I imagine there is. I found them in a dry branch that was sticking out of an uprooted bush kinda thing (dunno what it is actually, like a small tree or something that is long since dead). But that uprooted bush/tree is surprising to have any Incisitermes. During the last flood, the entire river was raging (and they are,, or were now, smack dab in middle of the river) and the bush/tree they were partly in was 100% underwater. So how they survived, I can only guess they barricaded themselves and the water couldn't get to them. In any case, hopefully I have better luck this time around. I haven't had the best success rate with Incisitermes minor, but I've only really had 3 previous colonies. Even subterranean termites can be hit/miss, I've had a lot of subterranean termite colonies die really quick. Then once in a while I get a really healthy colony, even with the same setup. So we'll see how this colony goes. As for setup. I used part of my old Acromyrmex versicolor setup, that was used as the water tray for them. Its not a huge setup like my previous colony was in, but its also open (I didn't put a lid on it) and allows them to forage. One thing I noticed they'll die right away to, is if they get put in a test tube (even glass test tube) setup, they die within hours in a test tube. Even if the test tube is open, they die really quick in them. I wouldn't recommend test tubes for Incisitermes minor, they need a lot of open air. Edited by Vendayn, March 12 2019 - 2:52 PM. I think the colony I found yesterday was remnants of the colony that I got back in October. They were actually in same exact spot. Granted, it may be a coincidence cause the river does wash the wood down and the wood gets stuck places. Almost positive there is no queen, but I'll keep them anyway because they can (supposedly) create a new queen. Like Subterranean termites are able to make secondary reproductives if they lose their original queen. Worst come to pass, I can give them alates in the August mating flights they have every year. Though I did see baby nymphs, so there must be something. And I looked all around the bush and in the dead bush, with no sign of any other termites. So maybe I did get her, but not gonna tear up the wood to find out as that highly risks injuring them. On the other hand, I found a massive colony of Incisitermes minor today. Easily over 1000 termites. They even have massive half inch long soldiers. I found them in a pile of branches and wood, so tomorrow going back to see if can't find more. I think I got the main part of the colony though, and I hope I got a queen. I'm sure I did, but tomorrow going to go back and make sure I didn't miss any major branches that may hold more. Colony must been there a while. Its funny, I spent so many years (over 10 years) trying to find Drywood termite colonies. Never even had a hint of luck. Now ever since last year, I find them easier than I do subterranean termites. Edited by Vendayn, March 13 2019 - 5:23 PM. I put my 4th termite colony in with the colony got on the 13th. I did it really slowly by putting one of the false workers in, and they joined forces. Even though definitely not same colony or really even close to each other. Which coincides with what I read, that in some situations there can be Incisitermes minor (like someones house for example) colony that meets another and makes a bigger colony. Though, I probably wouldn't recommend it still. I wouldn't have done it if either colony were both the same size or close in numbers. In any case, now I have one large colony of I. minor. They are also really healthy, none have died at all which is a good sign. They are also really active, going back and forth between the different pieces of wood. 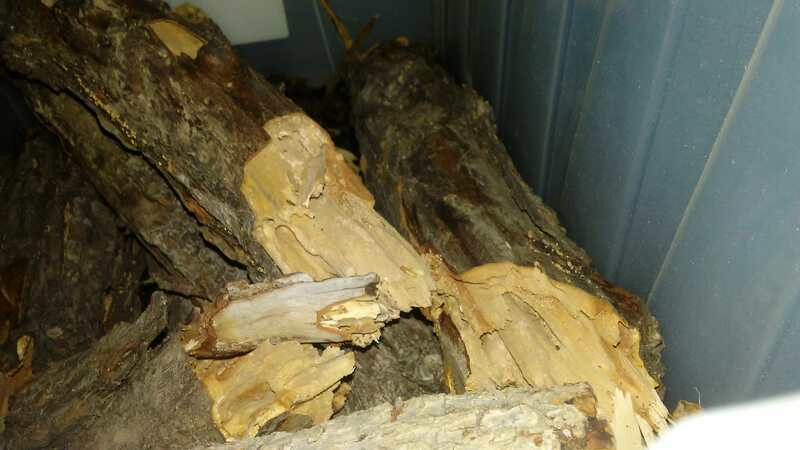 I did go back to the pile of wood a couple days ago, and I found two more branches they were in but nothing major. I looked pretty good through the pile, so I'm pretty sure I got the vast majority of the colony that was there. I may go back on Monday and triple check again, but it looks good that I likely got the queen. It wouldn't be anything great. It just be pictures of a small plastic aquarium with wood in it. The termites disappear too fast to get any good pictures. If you want to see the soldiers+the massive almost half inch soldier, I put pictures up in my ID thread. Without disturbing the colony, I wouldn't be able to get pictures like that now that they are all settled in.